The following provide troubleshooting solutions to some of the most common issues that learners experience. If your technical issue is not addressed here, please contact the PSKN Support Desk. If you are looking to purchase individual courses, you can easily buy courses through our website. Find the course you are looking to buy and click “Buy Now”. To purchase courses for a group of learners, please contact Lee Gauthier for pricing and information on how to register your learners. How can I schedule my licensing exam? To schedule an exam, please Contact PSKN’s Support Team. When can I expect a reply? For all other inquiries, our support team will be in touch within 3 business days. I forgot my username or password, how do I access my account? If you have forgotten your username or password, click on the ‘Forget your username?’ or ‘Forget your password?’ links on the login page and follow the directions provided. You will be prompted to enter the email address associated with your account. An email will arrive in your inbox with the instructions to reset your username and password. I tried to reset my username/password, but didn't receive an email with instructions. What should I do? The email address from which you will receive instructions is support@pskn.ca. Please check your junk or spam mail folders to see if the email has been filtered to one of these folders. You can mark the email address as safe or save it to your contacts so that our support emails will always end up in your inbox. Remember that your password is case sensitive. Verify that you are using the correct username and password. Your username would have originally been sent to you from support@pskn.ca. If you continue to have difficulty in logging in to your PSKN account, reset your username and password by clicking the links provided on your login page. Once you have registered and paid for a course from the PSKN catalogue, you have one year in which to complete it. What are the System Requirements for completing PSKN courses? I’m trying to access a course, but all I see is a grey screen. What should I do? This may occur because your Adobe Flash Player is not enabled. The first step is to download Adobe Flash Player from the internet. Flash is automatically enabled. 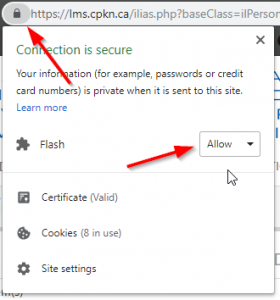 If you have downloaded Flash and the course continues to not load properly, contact support@pskn.ca. Click the padlock on the left hand side of the address bar, and ensure the drop down for Flash is set to allow. Click on Tools > Add-ons > Plugins and enable Flash. If you have installed Adobe Flash Player, and enabled it to work in your browser but are still having issues, please contact our support desk: support@pskn.ca.